ASGCA is the premier organization in the golf architecture profession. Membership in the Society signifies the ultimate recognition of an architect’s work, and a place in history among names like Ross, Jones, Nicklaus and Dye. Through ASGCA’s educational initiatives, special events, shared experiences and understanding, members also gain a collective knowledge that helps them to lead projects and realize greater success. Share and learn from others’ ideas, winning techniques and challenges. Secure speaking opportunities to showcase your own experiences. Validate your hard work, expertise and talents by displaying the ASGCA initials behind your name, garnering a “foot up” in a competitive market. Gain direct access to a vast array of leading Industry Partners reaping the benefit of their knowledge, resources and monetary assistance. Meet like-minded architects, contractors, shapers, etc. from other regions and countries, then collaborate on projects and other initiatives together. Make life-long friends, both personal and professional, who share similar passions and interesting diversities. Play at some of the finest private and public golf courses in the nation (and overseas) and gatherings with top architects to discuss the issues of the day. Tour and play some of the most historic golf courses in the world on bi-annual trips with architects from Australia, Asia and Europe. Gain free admission to professional and top amateur golf events in the US, annual conferences and other industry gatherings. 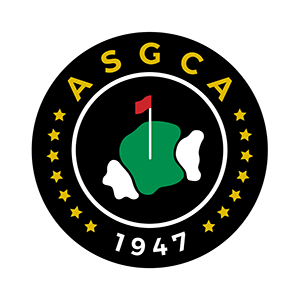 A prospective member of the ASGCA must be a citizen of the United States, Canada or Mexico, a minimum 28 years of age, have no less than 8 years of practical experience in golf course architecture and be recognized by other ASGCA members as a competent professional golf course architect. To become a member of the ASGCA, one must complete a two-year application process proving by virtue of their knowledge of the game, training, experience, vision and inherent ability, to be qualified to design and prepare specifications for a course of functional and aesthetic perfection and carry the design from planning through construction. Applicants must also provide evidence of direct project experience that illustrates competency in the core facets of golf course architecture. ASGCA members are very involved in the review of each potential member’s application and submitted projects, including direct review of project plans, interviews with construction personnel and club management, and a walking or playing tour of the course with the applicant. Each applicant must also be sponsored by three ASGCA members. The sponsors are members who can personally vouch for the character, professional integrity and high level of applied architecture skill of the applicant. In addition, all applicants must agree to abide by the ASGCA’s standards of professional practice and a stringent code of ethics. The code of ethics set standards for the golf course architect’s role in contract negotiations and their responsibilities to the client and each other. What kind of training do I need to become a golf course architect? Those interested in the field should become associated with a member of the American Society of Golf Course Architects to learn more about the various demands of the profession. For a list of members near you, visit our Find an Architect section. Which colleges offer a degree in golf course architecture? The College of Art in Edinburgh, Scotland offers a graduate-level certificate in golf course architecture. For more information about that program, visit the European Institute of Golf Course Architects website. How do I find work as a golf course architect? Golf course architecture is an extremely competitive field. Many golf course architects get their starts working as interns with established golf course architecture practices. ASGCA will occasionally publish contact information in the ASGCA Newsletter for those students looking either for internships or entry-level positions. Contact Aileen Smith at ASGCA for more information. In the Find an Architect section of this Web site, you may access contact information for all ASGCA members, including mailing address, phone number, e-mail address and Web site by typing in the name of the member. You may also search on location or area of expertise.